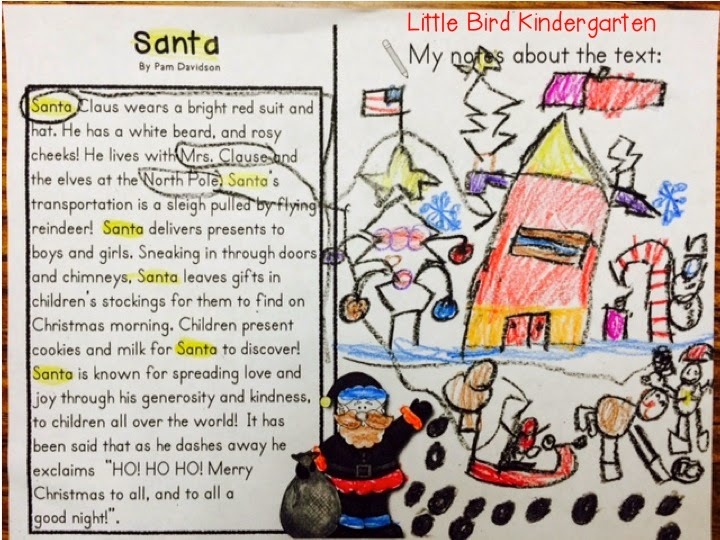 Holiday Edition Close Reading Annotations & Crafts! 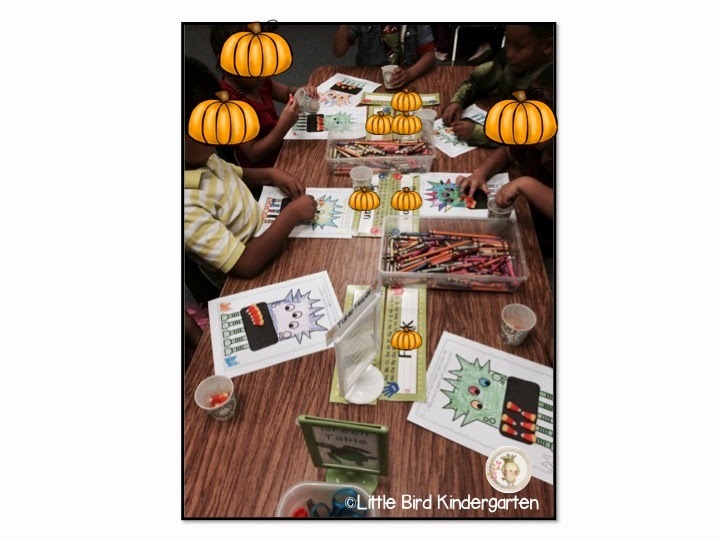 We did the close read activities, annotations, and I added a different little craft this year too. I found little white card stock circles at Michael's. They kind of inspired me (because I could use my 50% off coupon, and they saved me time)! 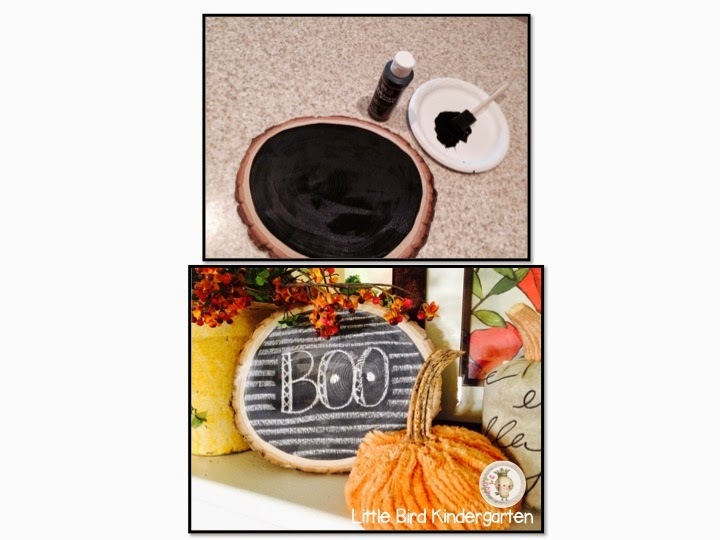 I saw the idea on Pinterest, it was a quick, cute and fun little craft! 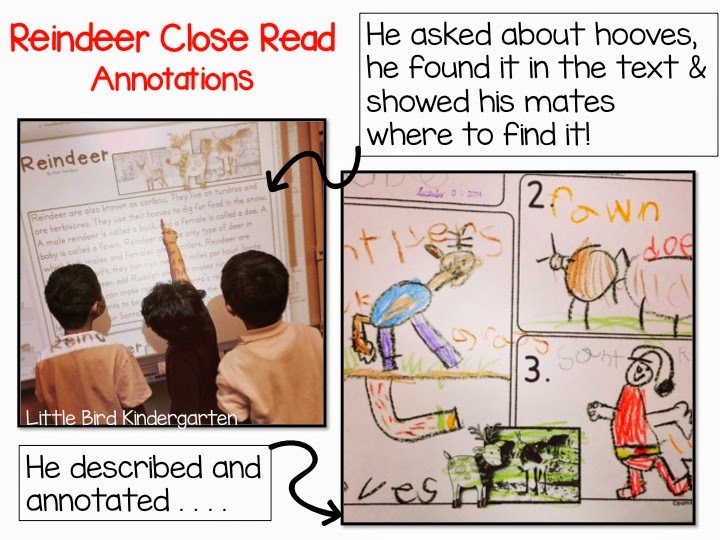 We have done lots of close reads now, and it is just so exciting to see the kids start making sense of text, and finding information from it. The term close reading in my classroom has definitely now become a verb! They are doing it! These were some SERIOUS annotations! They LOVED doing this. 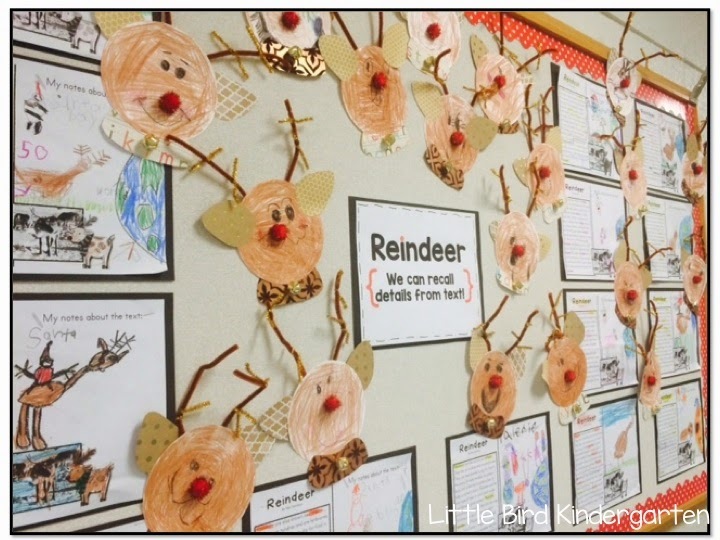 Amazing how you can engage them even during this crazy time of year when you choose the right content! If you are in need of something to hold their attention and align to the standards this might be for you! 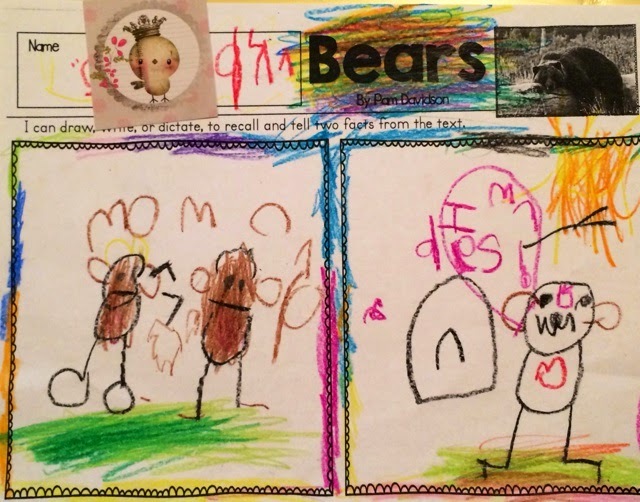 is my "Picture Talk". It has been a labor of love, and there are many more in the works! You can get a LOT of mileage out of this unit! SO much to do and learn! Close Reading - Oh the Places You'll Go! 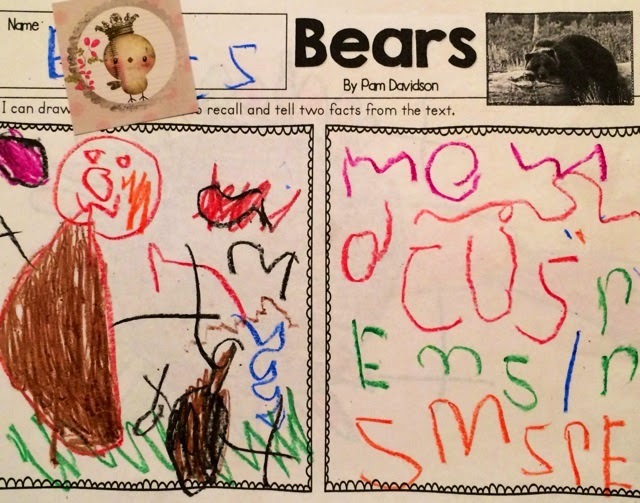 I have been doing Close Reading in my kindergarten class for about two years now! In kindergarten it begins as “close listening” and has become such an important part of my instruction! I am still amazed by how many standards can be integrated into one close read! dialogues and practice speaking behaviors that carry over into every other part of our day. 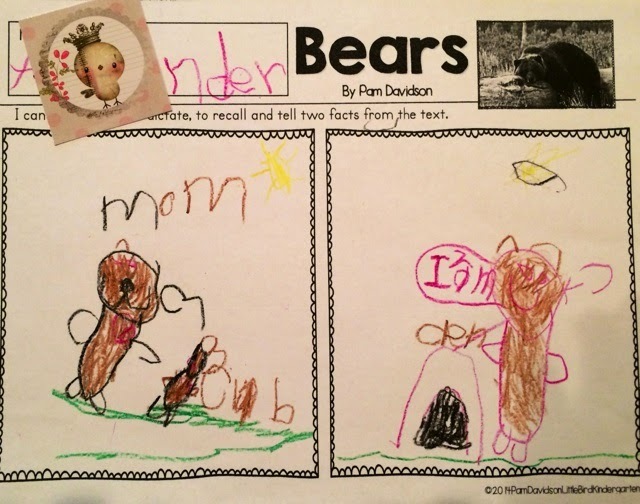 It takes a LOT of persistence to get to the point where five year olds can turn to their partner and ask a question, listen for an answer, reply in return, and then report to the group. It may not be one of the overt benefits of Close Reading, but it is one of the priceless intangibles, that promises great return on investment of time and effort! stimulate conversation, inferences and the showing of evidence also leads to writing! to the ability and understanding of the learner based on his or her own level of comprehension. 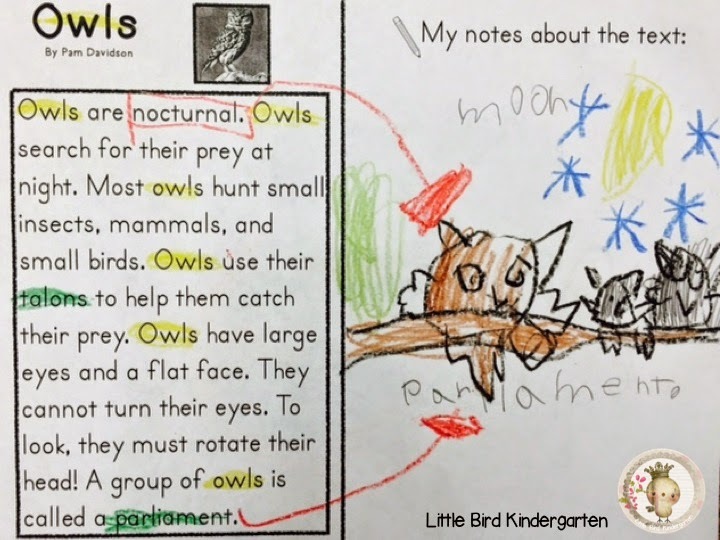 It is during these writing activities that I see the most growth with regards to demonstrating evidence of what we read in the text. Evidence becomes concrete for little learners when they can write it down, however rudimentary it may be! I began writing my own close reading passages two years ago when I could not find any to fit my search for interesting topics, appropriateness, engagement, and intentional use of vocabulary. If it’s new to you, try it out! I bet you’ll love it! 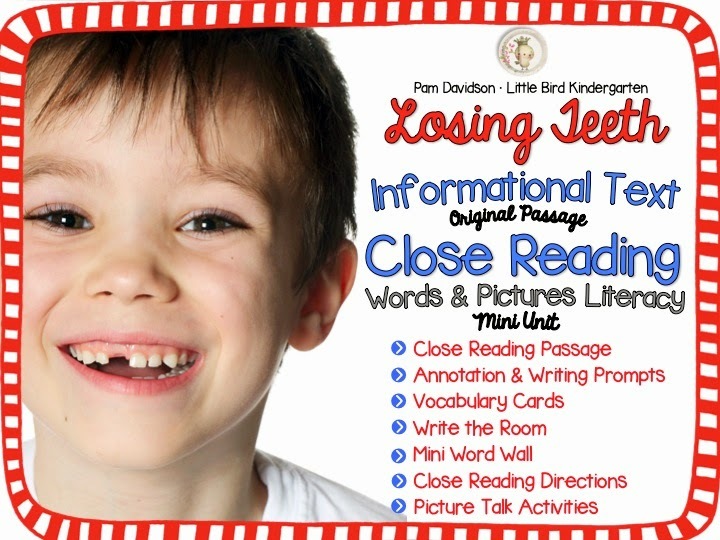 All of my close reading resources have complete instructions for close reading, partner talk, writing and more! 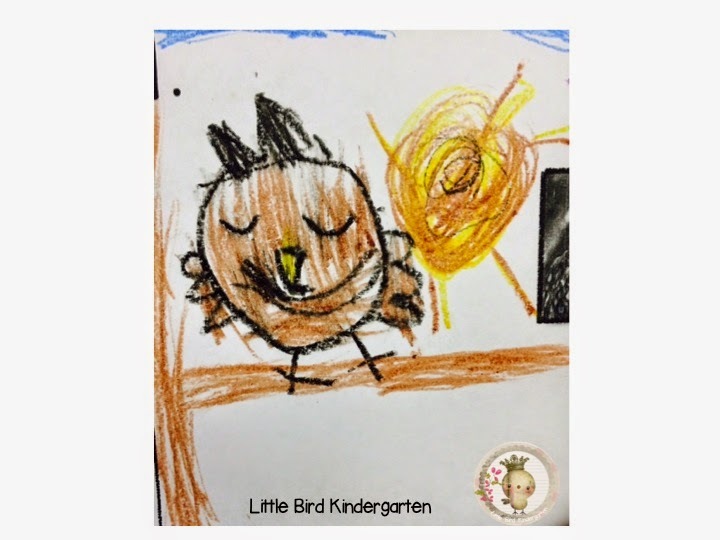 owl who was "Awake when the sun is shining because he is nocturnal"! 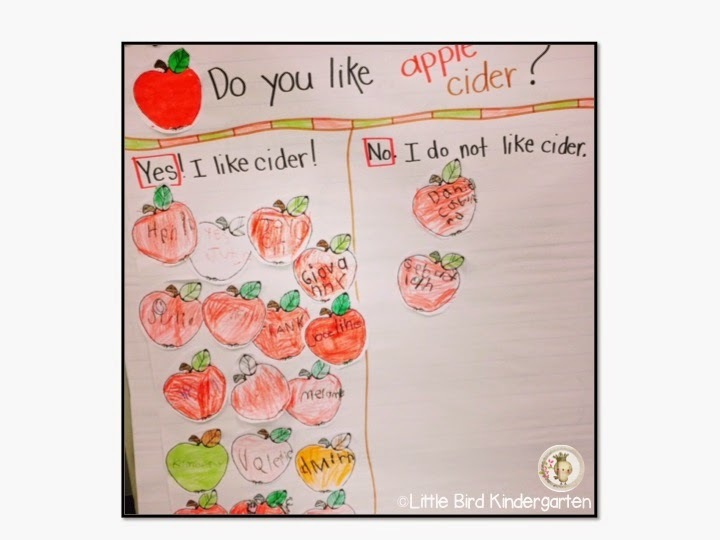 Nice way to inference based on evidence from the text you amazing little five year old smarty pants! 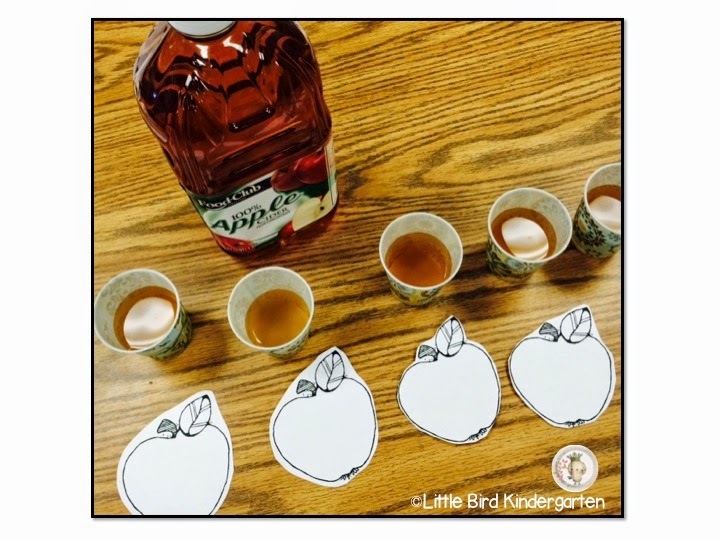 We ended up our work on the "Apples" poem close read this week with an apple cider taste test. 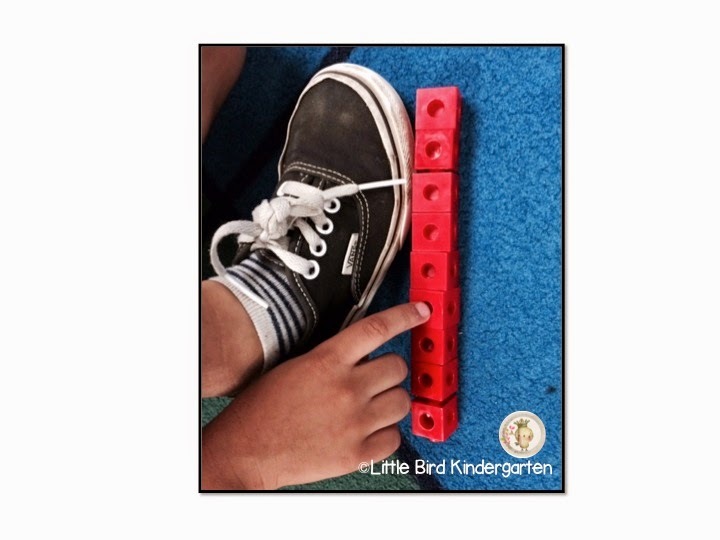 Because we have so many English Language Learners this year I used this activity to talk a lot about the vocabulary word press (vs. push and pull). They loved making the gestures for pressing the apples! 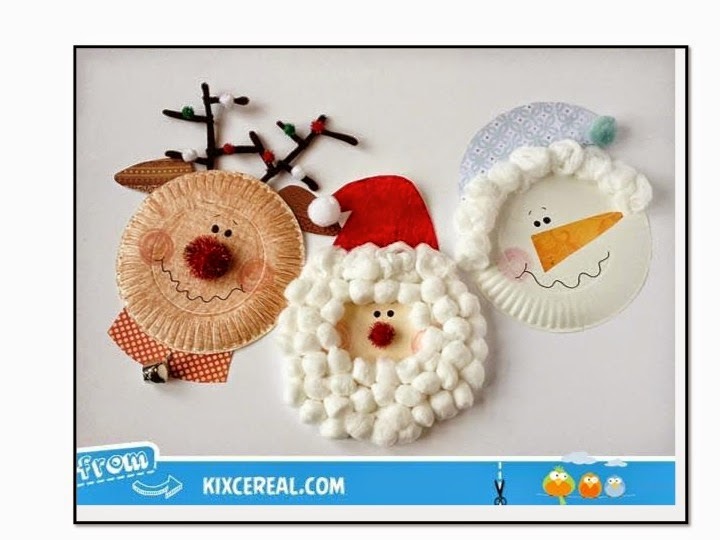 I found this cute video to provide a visual experience too! This was so much fun! I got the idea from Craftaholics (what a great blog!) The wood slice came from Michaels and I used my 40% off one item coupon, so it was a $4 and change project! hands, arms, etc., and compared them to each other. 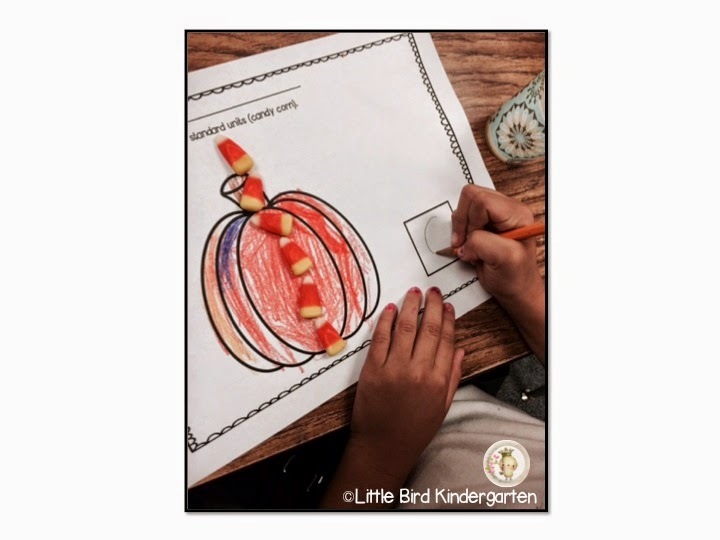 The candy corn measuring was fun too! Who says you can't do math with candy? You can grab that little Freebie right here! on quantity (number recognition and number sense) or greater and lesser than. I had totally planned on doing greater /less than with the pretzel sticks, but since my littles were SO hopped up on Halloween I opted for just quantity. They had a ball! 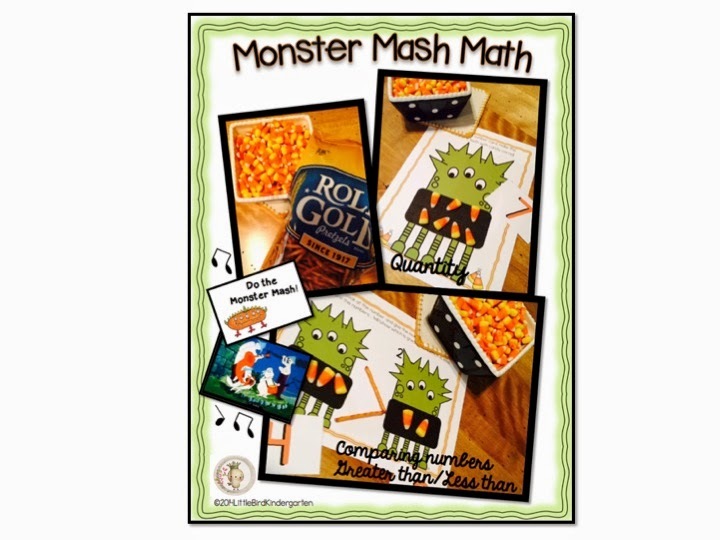 We played as a whole class, and when you draw the "Monster Mash" card you stand up and do the monster mash! Here's the link: Groovy Ghoolies Monster Mash Wish I could show you the video! Too many faces, but they were soooo cute! 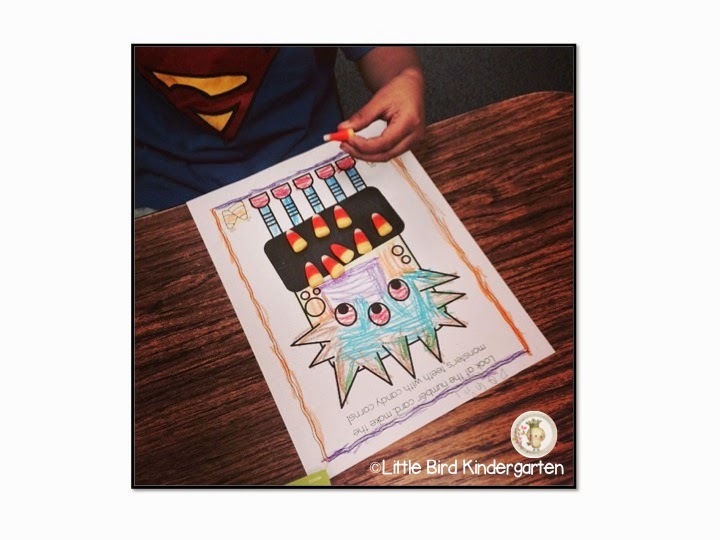 Since Monsters aren't just for Halloween anymore we will do the greater than/less than lesson soon, but with marshmallows for the monster teeth! Can't wait!! 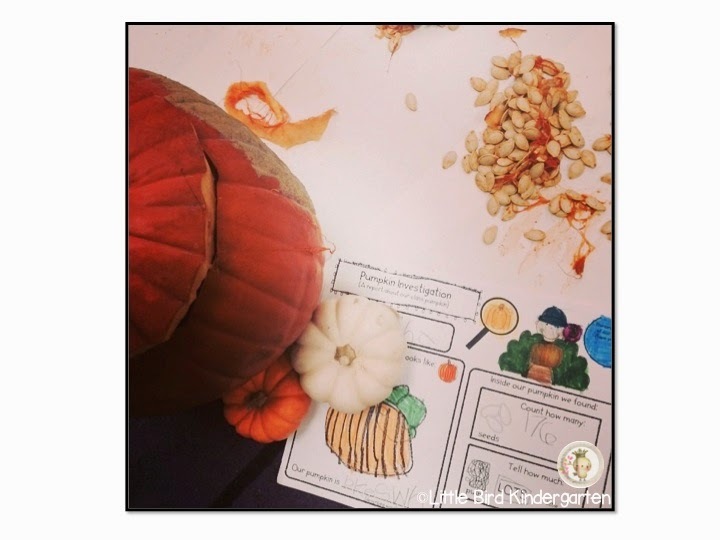 We did our Pumpkin Investigation this week too. 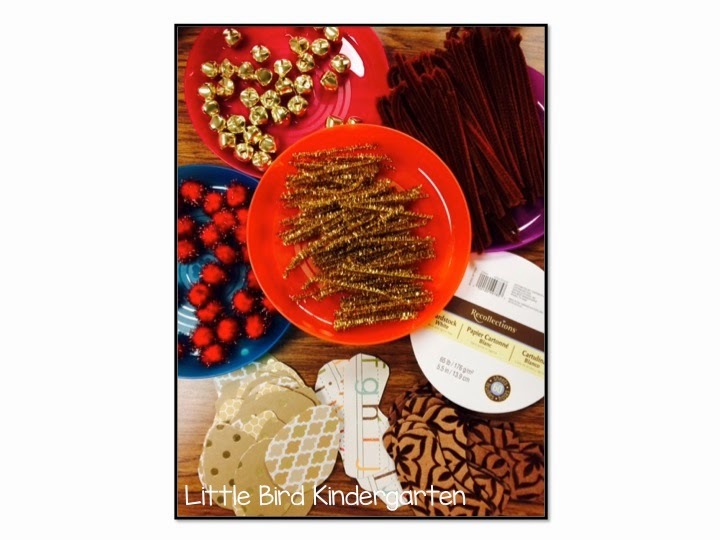 It's always so much fun and there are just so many skills to pack into this one activity. As I finished cutting the lid I asked "What they thought I should do to get it off?" Press, push or pull (gesturing too). They conversed with their partners and we gestured together to discuss the best method. I love it when vocabulary and context collide in an unplanned way! 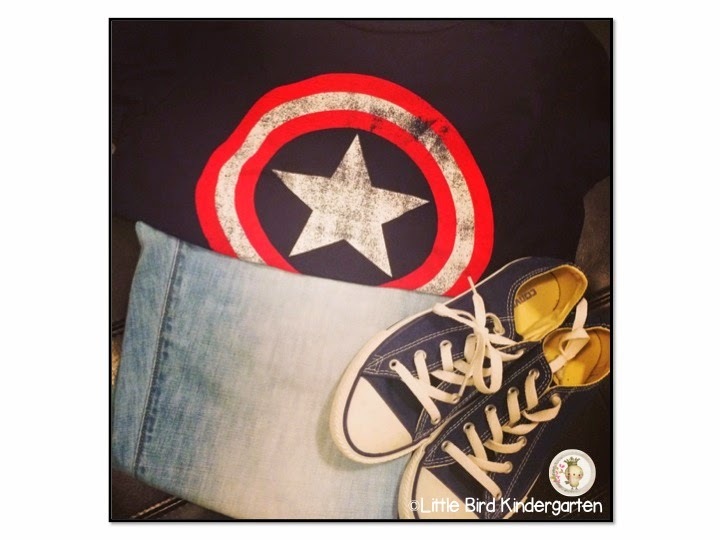 to the cutest little trick-or-treaters! There were decked out strollers and wagons with lights and everything! 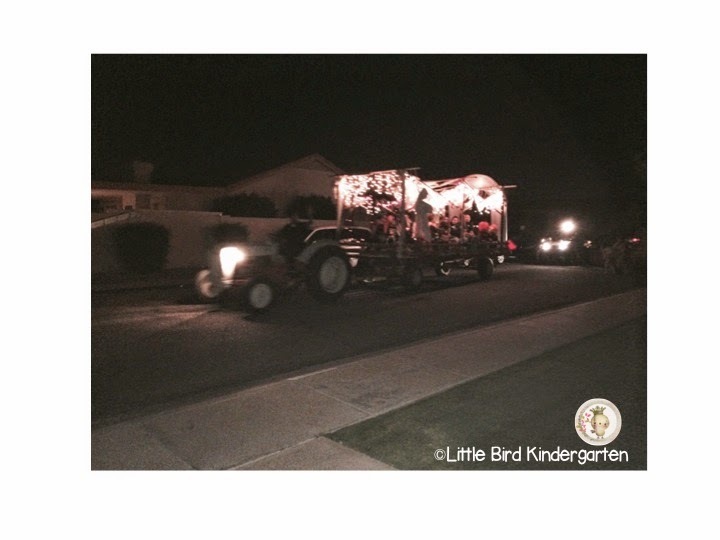 This flat bed hay ride always goes around the neighborhood at Christmas time to see the lights, but they decked out for Halloween too this year! So much fun and such a nice end to a busy week! Well hello! It has been three weeks since my last blog post. Three weeks? Really? Wow. Where did that time go? My class has kept me really busy and really tired! They are so cute, I mean really cute. Innocent and just full of love... but oh my. It's so opposite from last years class that it's really unbelievable. Last year's bunch was.....precocious! This year.... b a b i e s! Sometimes they want their mommy so much it makes me want my mommy! I am happy to report however, that we are beginning a love affair. You know the look, when you are teaching and they give you that face that tells you they approve of you and they know that you "get them". Uh huh, that one. Priceless. Now if I can get a little more English going and a lot more independence, then we'll be doing great! My "To blog list is a mile long! So this will be a little hodge lodge of projects and goings on! 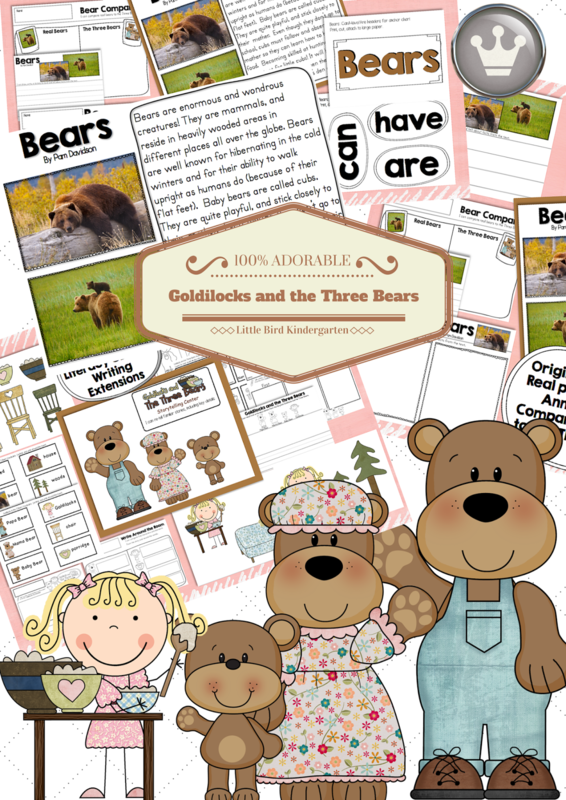 Goldilocks and the Three Bears... so far! 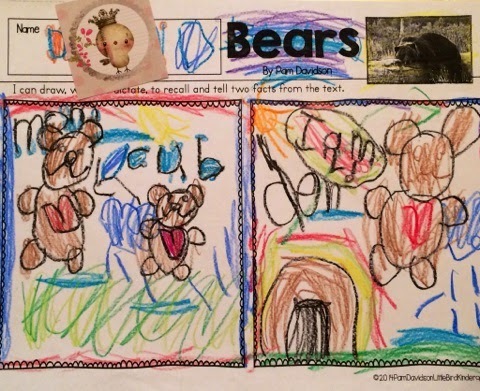 have hearts, so we all went back and added hearts to our bears :o) Their cuteness shines through in these work samples, and so do their varying ability levels! 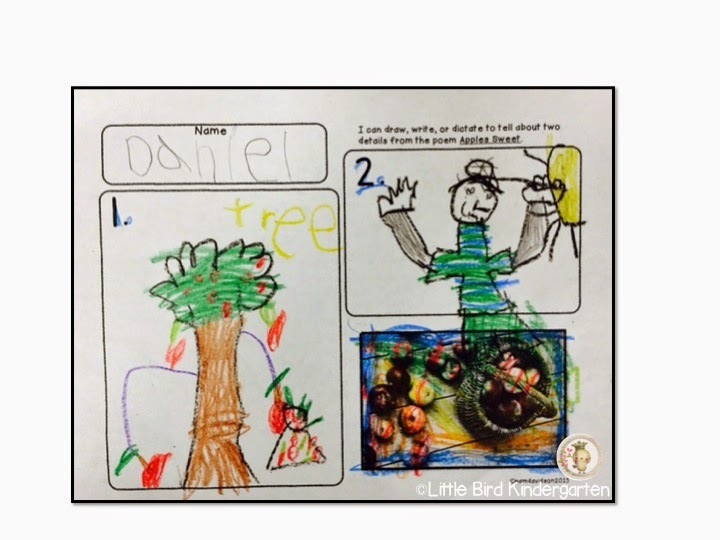 Next week we'll do our Story Sticks retell and the writing extension where we compare The Three Bears to Real Bears. Can't wait to see what they come up with! 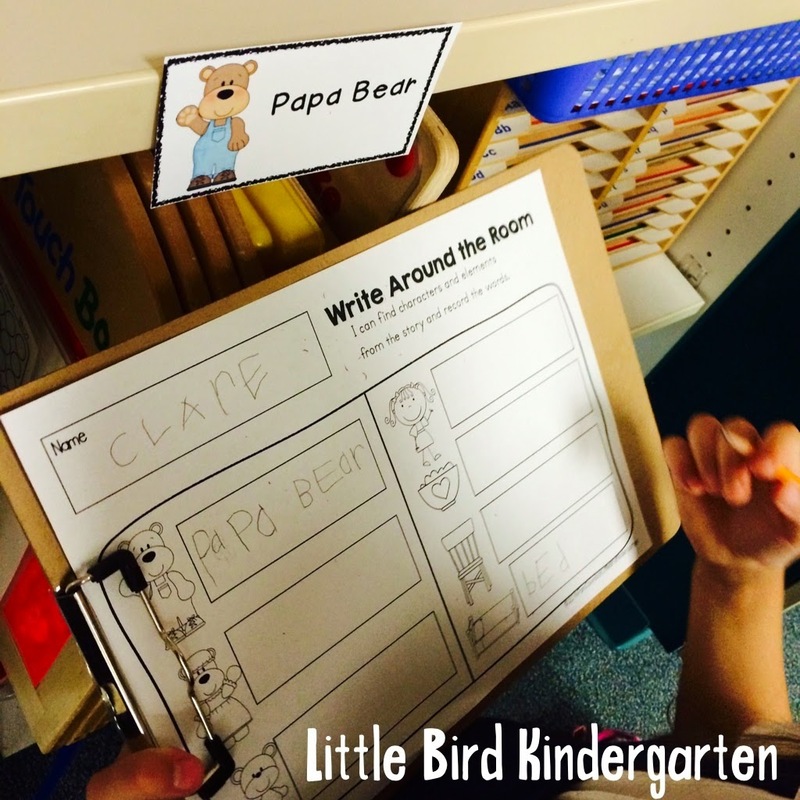 Writing around the room with Goldilocks and the Three Bears has been fun too! 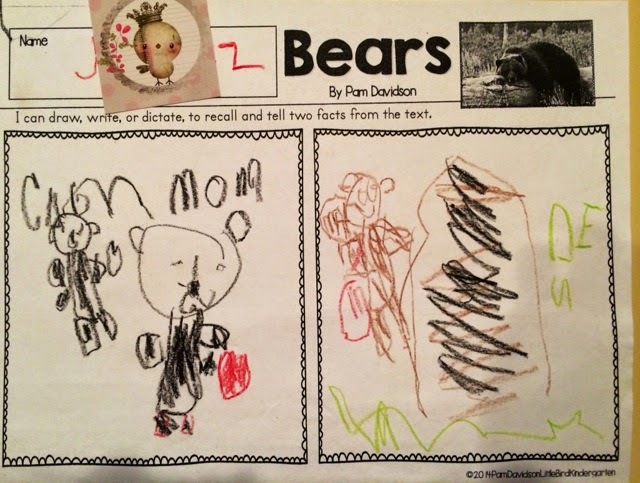 Love to see how they learn to handle holding the clipboard and pencil as they walk around, so many things going on all at once using so many different large and small muscles. Those tongues come in so handy sticking out sideways and helping us get our jobs done! 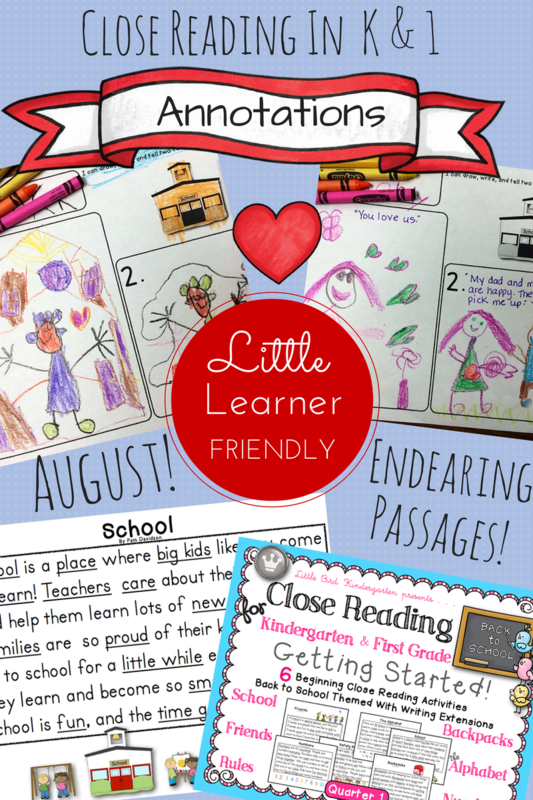 Activities Plus BEARS Close Reading! 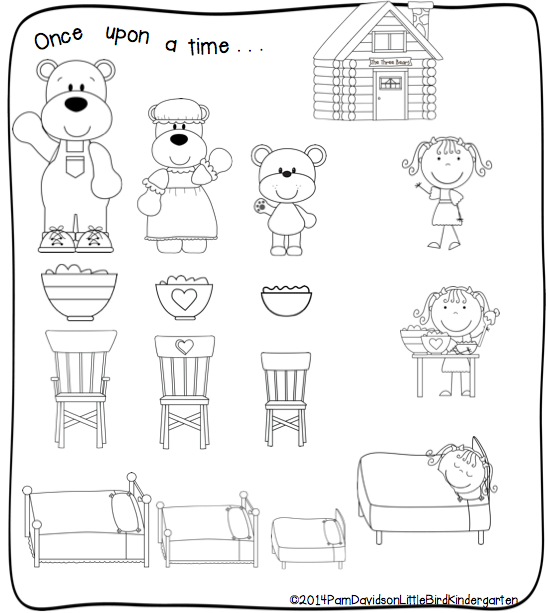 Here’s a little freebie from the unit, it really helps the little ones who have trouble finding the words to be successful at re-telling! going. Listen Up! First Sound Fluency Practice and Intervention Tool became a priority because I need it yesterday for this little group! It's been quite awhile in the making and is finally done! 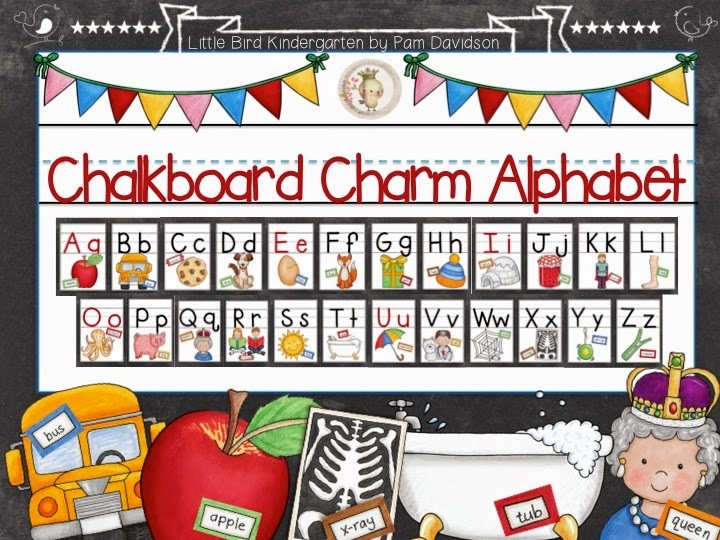 (26 pages strictly phonemic awareness). circle the pictures of the target sound, cross off the pictures that have a different sound. 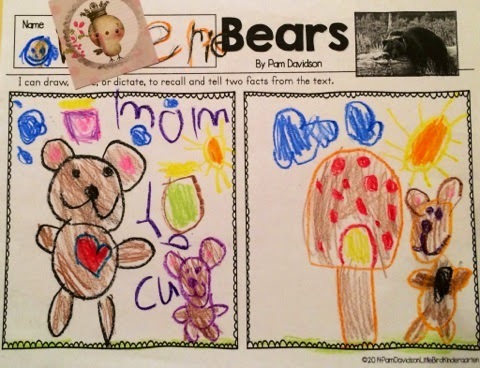 Very specific scripted teacher directions are provided on every page to support instructional assistants or volunteers in intervention groups. ANCHOR CHART for hearing the sound and saying it. Key word cards for each page. AND write the initial sound for every picture. 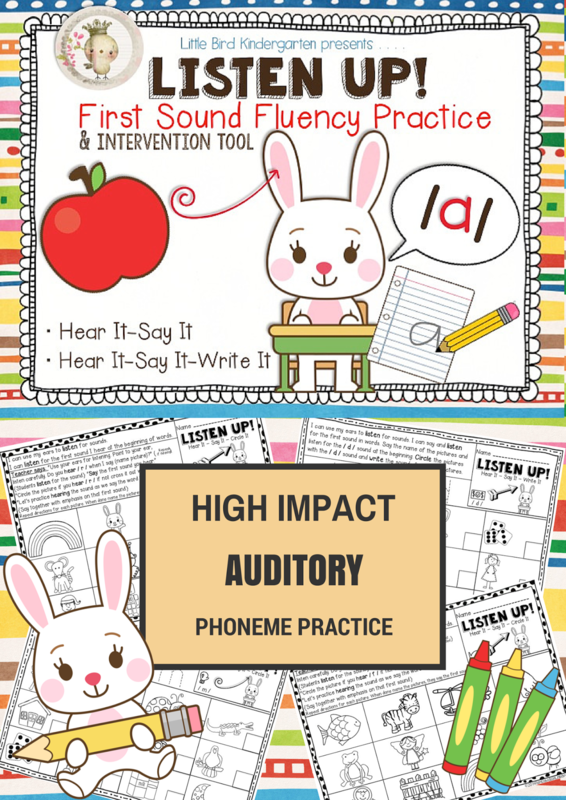 ANCHOR CHART for hearing the sound, saying it and writing it. Key word cards for each page. Here's a video to provide some insight about how to us Listen Up! is going great so far! Sweetest moments... I have a cute little class. They are BABIES. When I call them "littles", it really describes them. Lots of growing up to do! Good! My favorite kind of class! Such a huge contrast from the precocious smarties I had last year! I find myself backing WAY up. Beginning at the beginning is what they need. I decided to try one of my Back to School Close Reads, the one titled " School". It happened. It was the moment we fell in love. 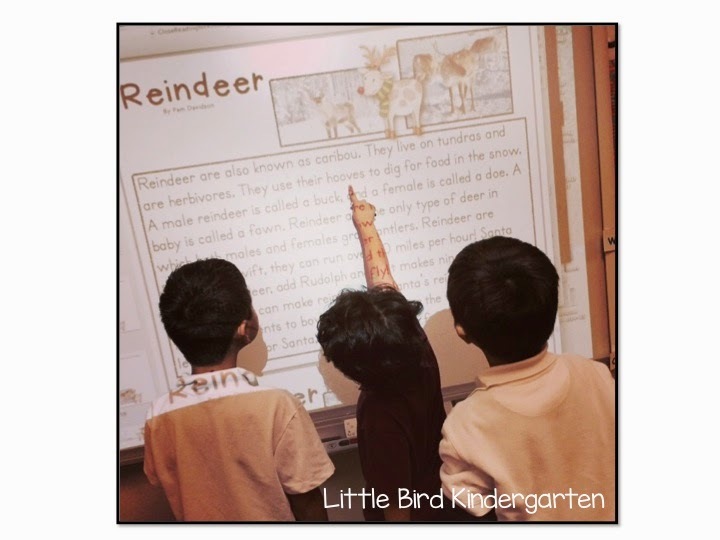 The PDF was on the smart board and we were reading/re-reading. We were talking about words we might not know or understand. One little guy said "What is tare?". It took me a minute, but... oh. Care. "What is care?". 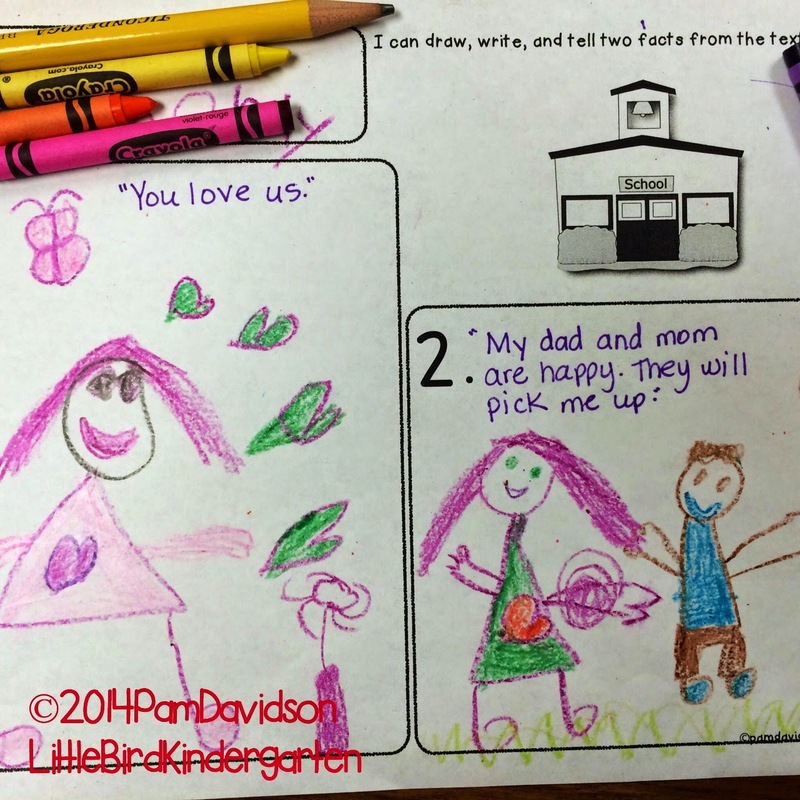 I explained that it means the teacher cares about you (making a heart with my hands placed over my heart). The look on his face. His eyes. The little sweet smile. "Oh. He said. "You yuv us." 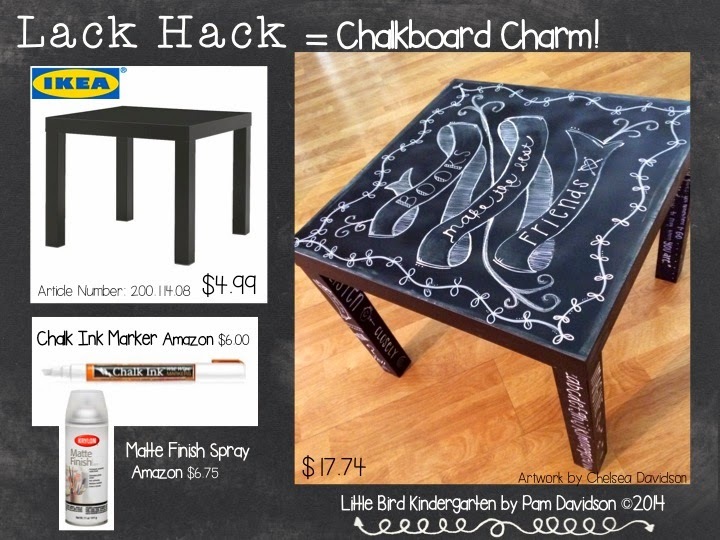 Back to School with the Hack of a Lack and Chalkboard Charm! Back to it! I was thinking today about why it takes me soooo long to get my classroom ready for school. I mean, I should have this down by now, right? After all this is my 26th Back to School! If I could just. Stop. Doing new things. And stick with something for a couple of years. Yes! That would be a great idea. Wonder when that will happen for me? My name is Pam & I have a problem. I. Like. Getting my classroom ready for school. I shouldn't, I am exhausted! I haven't been home before 6:30 in a week. What is wrong with me?!! Here's some of my trouble. Last weekend we were in IKEA to get a few things for our daughter for moving back to college very soon (sniff, sniff!) and I see it.... a Lack. No big deal, nothing exciting, I bought one last year for our son's night stand... but this time when I saw it, I had .... a vision. You see I have another problem. I am obsessed with chalkboards. I had a vision of a new little table for my classroom Book Nook. Muahhahahaha.... I burst with excitement!! My husband thinks I'm nuts. I might be. Oh my. Would it work? Not sure, but for $4.99 (IKEA Family Member Price) I decided it was worth a try. The idea hinged on my sweet, smart, and very talented daughter Chelsea. She and I worked on some sketches for the top and legs, I helped out a little with the ideas and artwork, and she got busy!! She really is amazing. :o) She used a little bit of regular chalk for shadowing, but mostly Chalk Markers that I had gotten from Amazon. After it was all done we sprayed it with several coats of Krylon, to seal and protect. My new bookcase is so super cute too! It was a lucky find at Lakeshore. I found it all put together and marked half price for "damage". Never figured out what the damage is! It is exactly what I was looking for. It has little label holders in the front that I made chalkboard labels for. This is such a cute book little shelf for littles to be able to easily access books that are organized into different categories. If you get an itch to be creative, then hacking a Lack might be a good project for you!! If you try it send me a picture, I would love to see it! It has been a busy summer! I am finally getting back to the business of school though! I worked on something I've been wanting to make for awhile now... a little set of posters to use as props for Back to School photos. I don't know about you, but I never get pictures taken on the first day. I want to, but it is just always too crazy! 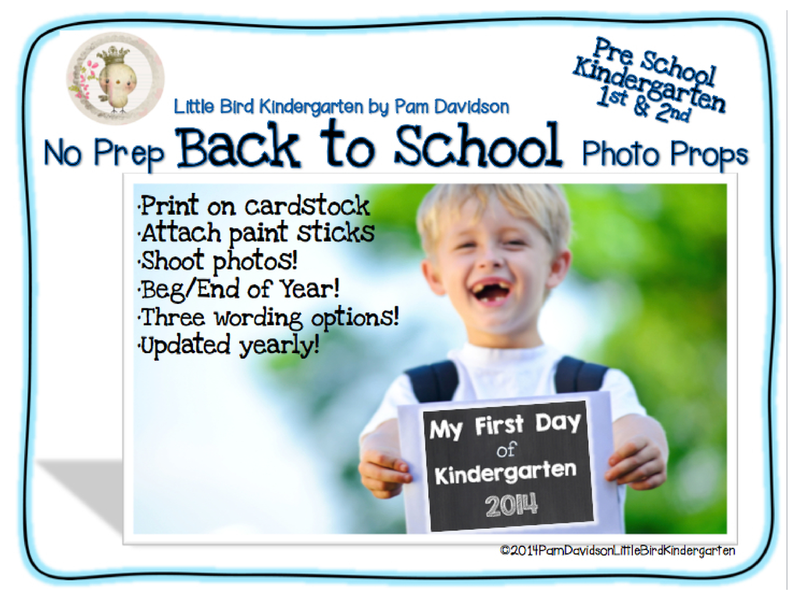 So my little signs offer options for the First Day of School, plus a couple of other wording options for those of us that can't seem to get that done right away! 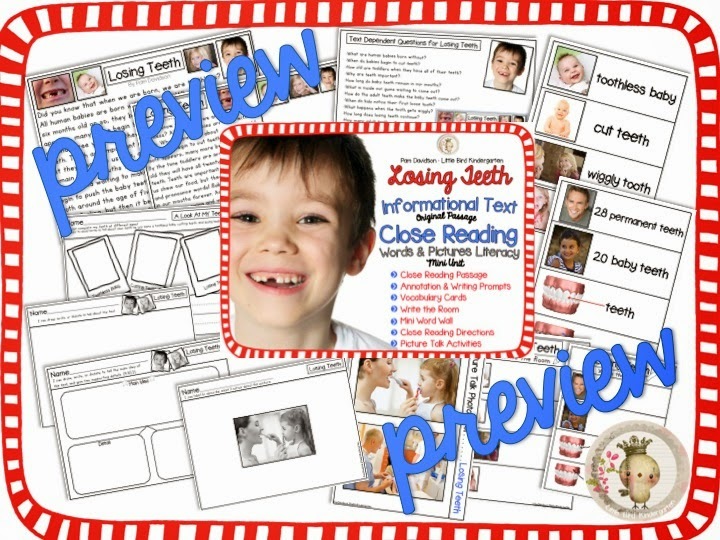 I am excited to use them for my pictures (beginning and ending of the year) and plan to have a few extra available just in case families would like to use them for their photo ops too!